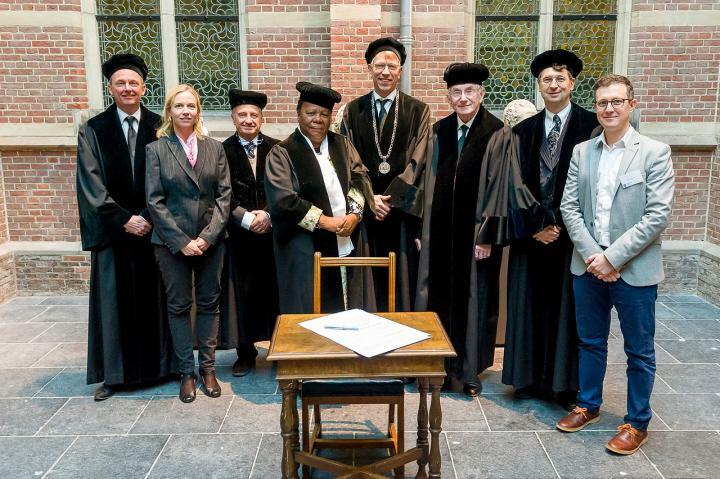 On Feb. 26,2018, the European Regional Office of Astronomy for Development (ROAD) was brought into existence at a signing ceremony at Leiden University in the Netherlands. It was preceded by a ceremonial address by Grace Naledi Pandor, South African Minister of Science and Technology. The occasion also marked the appointment of the Minister as honorary visiting Oort Professor of 'Astronomy for Development'. The ceremony signified the creation of the International Astronomical Union's (IAU's) tenth Regional Office, coordinated by the IAU's global Office of Astronomy for Development (OAD). The European ROAD will be operated jointly by the European Astronomical Society and Leiden University. Piero Benvenuti, General Secretary of the IAU was present to sign the agreement on behalf of the IAU: "Given their backgrounds, we expect a very fruitful partnership between the University of Leiden and the European Astronomical Society in hosting this 10th regional office." The global OAD was represented by Acting OAD Director, Vanessa McBride, who said "We are delighted to welcome the European Office to our family of regional offices of astronomy for development, and are excited about the opportunity this will present for a fresh perspective on the role of fundamental sciences in sustainable development." Regional offices work closely with the OAD to execute the vision of Astronomy for a better world, with a focus on a geographic or cultural region. The other regional offices are located in: Colombia, Jordan, Ethiopia, China, Portugal, Thailand, Armenia, Zambia and Nigeria. The newest regional office in Europe will carry out and coordinate relevant astronomy-for-development activities in all three Task Force areas defined in the IAU Strategic Plan — Universities and Research, Children and Schools and Public Outreach, focusing on accomplishing the United Nations Sustainable Development Goals in Europe. These tasks will be carried out in cooperation with existing activities of pan-European and national astronomical organisations. "Europe has its own unique development challenges. We look forward to working with the other regional offices in using astronomy and its related tools and skills to impact socioeconomic development" said Prof Roger Davies, President of the European Astronomical Society. The signing ceremony will be followed by a symposium on Science Diplomacy and International Development on 27 February, organised jointly by the European Commission Space Awareness project, Leiden Observatory, the Leiden African Studies Centre, the Leiden University Faculty of Governance and Global Affairs and the Leiden University Hague Campus. Minister Pandor will give a lecture on Science Diplomacy and the Square Kilometre Array. The IAU is the international astronomical organisation that brings together about 11 000 distinguished astronomers from around the world. Its mission is to promote and safeguard the science of astronomy in all its aspects through international cooperation. The IAU also serves as the internationally recognised authority for assigning designations to celestial bodies and the surface features on them. Founded in 1919, the IAU is the world's largest professional body for astronomers. The IAU established the Office of Astronomy for Development (OAD) in partnership with the South African National Research Foundation (NRF). The OAD was officially opened on 16 April 2011 at the South African Astronomical Observatory (SAAO) in Cape Town, South Africa. It is tasked with the implementation of the IAU Strategic Plan including the establishment of regional offices and three astronomy-for-development "Task Forces". The OAD coordinates an annual open Call for Proposals seeking innovative projects for each of the Task Forces: Universities and Research (TF1); Children and Schools (TF2); and Public Outreach (TF3). Founded in 1990, the European Astronomical Society (EAS) promotes and advances astronomy in Europe. As an independent body, the EAS is able to act on matters that need to be handled at a European level on behalf of the European astronomical community. In its endeavours the EAS collaborates with affiliated national astronomical societies and also with pan-european research organisations and networks. Leiden University, founded in 1575, is the oldest university in the Netherlands. It is one of Europe's leading international research universities and has seven faculties in the arts, sciences and social sciences, spread over locations in Leiden and The Hague. Leiden Observatory is the astronomical institute of the Faculty of Science of Leiden University. Established in 1633, it is the oldest university observatory in operation today.